Extrovert singer, style icon and mother monster has the honor to flaunt on the cover with a outstanding pink evening dress, where I still don't know the designer of (shame on me!). 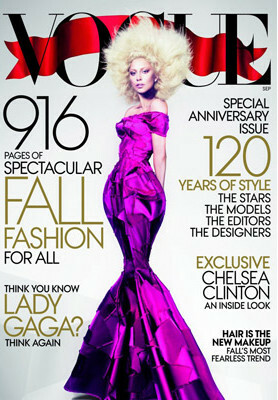 Here above you'll also see three pictures of Lady GaGa in the number one fashion magazine. As you can see with a lot of fur wrapped around her body or on her head. I can see Anna Wintour's input in the styling. Here above a video that I've found on the website of Vogue. It's a behind the scenes video from the shoot. Totally worth it to take a look at it. Hope you'll enjoy it!